Tris2-chloropropyl phosphate raw materials - ZhangJia Gang YaRui Chemical Co., Ltd.
Tris2-chloropropyl phosphate TCPP raw material with three phosphorus oxychloride and epichlorohydrin by phosphoric acid, three in catalysis of AlCl3 (2, 3- two Lv Bingji) ester mixture. 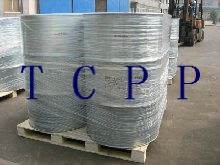 Above is the detailed description of the product raw materials, such as the Tris2-chloropropyl phosphate TCPP raw materials to further understand please contact us. If Tris2-chloropropyl phosphate raw materials product is not what you want, we can be customized according to your needs, please send us your order to Email: sales@yaruichem.com , or click here to post your buying lead.